I have a couple of goats that I've thought would be surefire candidates for a "Most Annoying Goat" award if there was one. Well now there is. Under the plastic is dirty straw and discarded hay from cleaning out the barn. I plan to scatter it over the pasture seed we'll plant after we get our soil test results. Any time Surprise is in the back field, she makes a beeline to this pile and pulls the plastic off. The more brick and rocks I have holding it down, the more determined she is to do it. The chickens then proceed to scatter straw all over the place, which I do not want. The other day the boys were grazing in the front, so I wanted to let the girls in the back. To keep Surprise from pulling the plastic off, I decided to try a goat deterrent. Somewhat satisfied, I opened the gate and let the girls in. Jasmine's already losing interest but Surprise is taking a closer look. A squirt with the hose is always the deciding factor. Sneaking around to the other side to try to get at that plastic! She had snuck around to the other side to see if she could get at the plastic without me noticing. Needless to say she had no success and gave up. Score one for me. Finally! 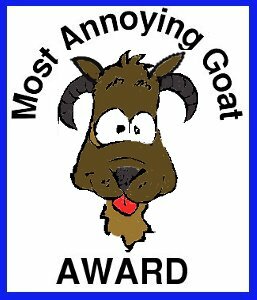 Do you have a most annoying goat? Acquiring this book was one of those "one thing leads to another," events. 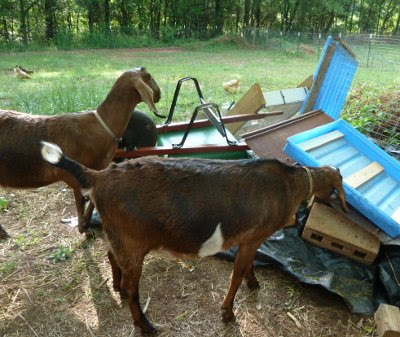 It started with the Kinder Goat Group message board, which led me to purchase Pat Coleby's Natural Goat Care. In reading it, I learned she is an advocate of remineralizing one's soil, and she frequently referenced a man named Neal Kinsey in that regard. 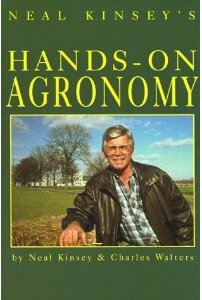 While visiting her publisher's website I discovered that he also had written a book, Hands-On Agronomy: Understanding Soil Fertility & Fertilizer (co-written with Charles Walters). While doing a little online book price comparison, I discovered that Mr. Kinsey also has a soil testing service. I immediately ordered the book and a soil test. (I'll share about that after I get the results). The timing for this purchase was absolutely providential. One of our 2012 goals is pasture improvement and I was puzzling over how to substitute organic fertilizers for the chemicals recommended by the state cooperative extension service. 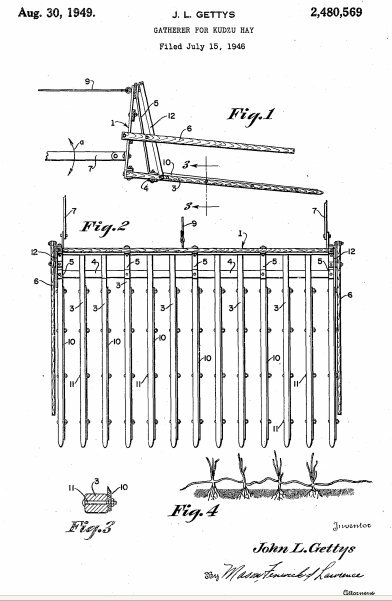 A Kinsey soil test will tell me how to do that, and not just for nitrogen, phosphorous, potassium, and pH, but also for the various other minerals that are necessary as well. Right off the bat I can tell you two things about this book. Firstly is that it is truly written for the layman. Secondly, is that I don't immediately understand everything he is saying. Not because it isn't written well, but because this is an area in which I have little knowledge and experience. For me, it's not a read and think "oh yeah, I get that." It's material that I have to read carefully and ponder because it digs deeper (hmm, is that a pun?) than any organic gardening book I've read so far. Perhaps I could say that it gets to the root of soil and hence plant health (yeah, I know :) more so than any other book I've read. In addition, it's written with examples for many soil types and problems, some of which don't apply to me. Even though I don't have a full grasp on the material yet, there are two themes that are sticking in my head. Feeding the plant focuses on a specific deficiency. When my broccoli leaves turned purple, I sprinkled the soil with bone meal to correct the problem. I assumed my soil is deficient in phosphorous, so that's what I addressed. I say assumed, because I could have a phosphate deficiency, but I could also have adequate phosphorous that simply can't be utilized by the plant. Phosphorous availability is effected by pH, the clay in the soil, the time and method of application, aeration, compaction, and moisture. Also, it is effected by the amounts of the other soil nutrients. That's where nutrient balance comes in. Too much phosphorous could render my soil just as unproductive as not enough. The bottom line is that if I do what it takes to make my soil healthy, it follows that what I grow will be healthy as well. If what I grow is healthy, then everything that eats it will be healthier too. Rather than having to supplement my goat feed with vitamins and a mineral mix, they should be able to get most of the minerals they need directly from what they eat. The same is true for us too. That's why this is so important to me. While I wait for my Kinsey soil test results, I'm giving the book a first go through. When my results arrive, I will be able to re-read with those in hand, and walk away with what applies to me and our soil. Even though we are anxious to get that pasture established, we want to do it right. Hopefully I'll have an update on that soon. It would be considerably easier on the humans if he liked to play fetch. Oh, he'll play, but only if it's two, no more than three tosses of the ball or stick, and only if it's not more than 6 to 10 feet. Fetch is a wonderful way to exercise a dog and wear out a puppy, but he'd rather play tug or wrestle. This is okay during designated play times, but not okay when the goats are the object. The other thing I'd like to teach him is about barking. Barking at the goats and chickens is not okay, barking at things that don't belong here is okay. The neighbor's dog (the one that climbed the fence to wreak havoc in our pasture) barks nonstop when it's outside. Even when it's people are in the yard. 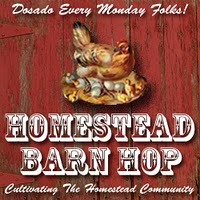 Kris is catching on to the homestead routine pretty well. My only issue with him is that the other day I caught him with an egg. He had it between his front paws and was beginning to put the bitey on it. I got it before it broke, but I wonder if he hasn't found them before and eaten them. I have a couple of hens that insist on laying in or near the hay rack in the goat shed, rather than in their nesting boxes. Too bad chickens aren't as easy to train! At least I can deter him by closing the gate to that stall. What I can't deter is how quickly he's growing. Sometimes it seems as though somebody swaps our Kris for a bigger dog during the night. I confess that was something I never considered when I got him. I just knew he was the dog for us. The sink will go under the window, so the first step was installing the base cabinets. We started with the corner cabinet. This is the one Dan shortened so we could fit every thing across the 11.5 foot wall. Next was the sink cabinet, but first, something had to be done with the air duct opening in the floor. Of course, in typical old house "this can't go right the first time" upgrading fashion, the elbow is a modern 10 inches in width, while our old ductwork is 12 inches. Dan just centered the elbow over the hole and covered the gaps. Then he created a "duct" on the bottom of the cabinet. This solution worked beautifully and the air does indeed come out as it's supposed to. A vent cover will eventually finish off the opening. Next, the wall. I had leftover wallpaper after papering the dining nook, but there wasn't much and it was too expensive to purchase another roll. Consequently I had to make every square inch count. Since this wall will contain a combination of cabinets and shelves, I figured why wallpaper behind where the cabinets and fridge will be. Once everything is in place, who's going to know except me, Dan, and you? This is an inexpensive stock laminate countertop; nothing fancy. It was originally a standard 10 foot length, so we had to cut it to fit. The back splash was molded in, but we had to add the end splash on the right, and an end cap on the left. Notice that the vent cover is in place too. Next, we put in the sink and did the plumbing! Now here's an odd thing. I'm always delighted when I'm working in the soil and find an earthworm. If I find one somewhere other than the garden, I'll often take it there. Somehow though, photos of worms are creepy. Why live are okay and photos not, I don't know! These are Red Worms, Eisenia fetida, also called Red Wigglers. They are a type of composting worm and differ from earthworms. The common earthworm's scientific name is Lumbricus terrestris. Earthworms are burrowers. They like to live deeper in the ground and that's where they do their "composting"; good for the soil, but not good for collecting. They are also usually found one at a time, by themselves. Composting worms live closer to the surface, preferring to munch their way through rich organic matter. This makes their castings easy to collect. These are better adapted to "group" living conditions, which probably explains why they multiply so fast ( I read up to double in 90 days). Besides the Red Wigglers, another common variety of composting worms is European Nightcrawlers, Eisenia hortensis. In Compost Worm Countdown,.....2......, I showed you how I divided the worm bed in half. I have a large sheet of damp cardboard covering their half, on the right. For the lid, we bought two sheets of corrugated vinyl roofing. Right now they're just set on top and weighted down with rocks. Soon they'll be attached to a frame. They are light weight, opaque, and easy to manage. My only concern will be the temperature inside the bed. It gets some morning sun and I worry that it might get too hot, so it's something to keep an eye on . Now I'll just have to wait and see how they do. Hopefully my new "livestock" will be happy in their new home. We put down three coats of high traffic oil based semi-gloss polyurethane. I'm really pleased with the results. Since this was the best spot for the wood cookstove, the dip needed to be fixed so we could level the stove. In addition, this a high traffic area, so we needed the cement floor protector to be flush with the floor so it wouldn't be tripped over. As you can see, it turned out well. The floor is pretty near flush with the hearth. It's only off about 1/16th of an inch in the corners, and 1/8th of an inch on the side. We didn't expect that the floor would be perfectly flat and level. And it's not. But it's a whole lot better than it was before. Now we can start to put the kitchen back together again! I am soooooooooooo ready for that. Mild winters have their pros and cons. On the plus side is not needing so much wood to heat the house. On the down side, more overwintering insect pests survive. This past winter being mild, meant fresh greens, root crops, and broccoli all winter long. Unfortunately not only did those garden goodies keep growing, so did the weeds. Almost everything I planted last fall has bolted, except the parsnips, alliums, and lettuce (thankfully, we're loving lettuce and broccoli salads.) That means it's time to harvest whatever's left and clean things up a bit. Some plants I'll let grow for seed, what I can I'll store, the rest will be fed to the goats. The exception is the garlic, which I'll harvest when the tops begin to die back. I've never had garlic do this well and as you can imagine, I'm really pleased. We use a lot of garlic so I've gradually been increasing it. Hopefully this fall I can plant a whole bed's worth! After my piddly potato harvest last year, I'm amazed at how many volunteers I have. It would appear I'm not all that great at harvesting potatoes as I thought. Pictured above are volunteer Red Pontiacs. Dan likes these but I couldn't find them locally as seed potatoes. Instead, I planted 10 pounds of Red Norlands. I hope the potatoes do well this year. I've missed them as a staple in our diet. My spring planted peas and turnips are making a showing. Not many of the turnips came up, which is a little disappointing because these are a new variety for us, Golden Ball. If I can get enough for a taste and more seeds, I'll be happy. Sweet potato slips are the only thing I got an early start on. Things were/are just too disorganized with our kitchen remodel for me to get to starting any seeds. Fortunately we have a long growing season, so everything can be directly sown. As you can see from the first photo, we are not past danger of frost yet. According to NOAA's frost/ freeze data, I have a 50% chance of frost on April 15, a 10% chance on May 5. As most gardeners know, the trick is to not be in too big a hurry! I usually start my spring planting the latter half of this month. I am so looking forward to that. "Remember ...Bedding is your friend!!" Shredded cardboard always seems to be the most highly recommended, as well as paper. These must be the non-glossy type and the colored inks must be soy based (thankfully common nowadays). Egg cartons (which I don't have) and leftover rolls from toilet paper (which I do have) or paper towels (have on occasion) are good too. Initially I found shredding the cardboard to be time consuming. I tried scissors and a box cutter, but eventually figured out that if I wet down the cardboard first, it was much easier to tear. This is good, because being able to use cardboard, junk mail, and scrap paper for the worms, is one of the reasons I wanted them. There's never a shortage of these items, so this is the perfect "no waste" way to dispose of them. Barn muckings from last year, slow to completely decompose over winter. Partially rotted manure or plant matter is good too, as long as it's not fresh. 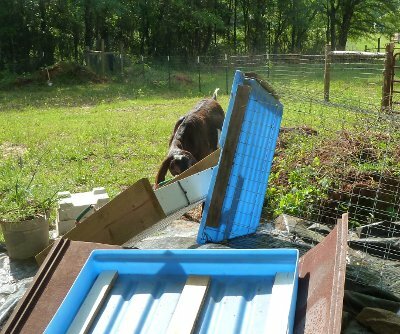 Manure, straw, and hay from cleaning out the goat shed and chicken coop are the basis for my compost piles, which I turn as I remember, and sift as needed. I use the finished sifted compost for the garden, and can add the larger partially decomposed matter can be added to the worm bed as needed. The problem with fresh manure or green plants, is that they generate heat as they begin to decompose, which is how we know our compost piles are working. Worms prefer temperatures more like we do. Plus, the worms need the microbes found in decomposing matter. This is what they actually eat, not the matter itself. Autumn leaves are good too, though their down side is that they don't absorb and hold moisture by themselves; better to mix with cardboard. Most of my leaves end up as winter mulch for garden beds, but I did have one pile that is decomposing, which is good. The bedding needs to be wetted down to keep it damp, not soggy, just damp. Non-chlorinated water only. The bedding needs to be prepared at least several days to a week before adding the worms. This gives the bed a chance to begin to establish the microorganisms that the worms eat. Since my bed frame is large, it finally occurred to me to put a divider in it to start. This will give me time to fill the other side with more bedding by the time the worms need it. Actually, this is similar to Tom's method of harvesting casts. Now it just has to sit and age a bit. I'll keep an eye on it to make sure it doesn't dry out. Still on my to-do list, is a cover for the bed. Even just mixing this up attracted a curious robin. After that I'll be ready for my worms! The instructions on the can said to wait at least 4 hours in between coats. The instructions on the can said that if coats were applied within 12 hours of one another, no sanding was required. Our goal was to make a day of it and get three coats down. Enter reality. Applying the 1st coat of polyurethane finish. ... through the pantry window. Is this anything like leaving your handprint in newly poured concrete? You'd think that by now we'd know better than to have very high expectations for the time frame of our projects. At least we know from experience that this too shall pass. In my last kitchen remodel post I showed you the newly installed floor. Dan had to go out over the road right after we got it down, so the next steps had to wait, the next steps being staining and then applying a polyurethane finish. Color of course, is a subjective preference. In my mind's eye, my new kitchen had dark floors. 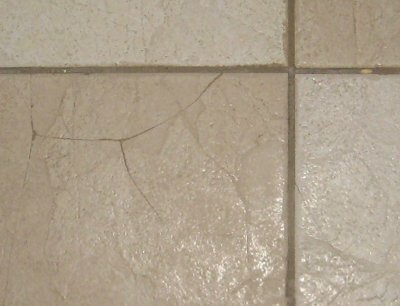 The original ceramic tile (besides missing grout and being badly cracked, photo click here) was light in color and showed every spill and speck of dirt. The hardwood underneath was dark, but in very bad shape (photos & problems here.) The new pine plank floor, in it's natural state was light, and looked clean and bright on the floor. Problem was, neither Dan nor I liked it that way. To stain it darker though, is one of those decisions we were hesitant about. Paint is one thing, it's color can be changed if it doesn't work out. Stain cannot. Still, my kitchen wanted those darker floors. This is odd for me because I'm all about light, though I admit the solid white kitchen we started with (photos here) annoyed me, because I'm all about color too. The problem is that a dark surface absorbs light, especially a dark non-reflective surface. Dark is also said to give the illusion of smaller, while white expands, but good grief my kitchen is really small no matter what. No sense trying to pretend it's not. What I noticed in the hundreds of model kitchen photos I looked at, was that the "success" of dark cabinets and floors, was based on their finish. Those with a flat finish appeared dark and close and I didn't like them. Those with a glossier finish worked for me, because they reflected light, brightening up the kitchen tremendously, while still giving the "look" I was going for. We were really happy with it when we were done. I love how it "aged" the floor, giving it the rustic old farmhouse look we were going for. I did not get any photos of the process, because it took the two of us working in a coordinated and timely manner. Dan applied the stain and I wiped up the excess. Since we managed this floor is warm weather, it didn't take all that long to dry, unlike the dining/living room floors, which took forever to dry in December! Next step, applying the polyurethane (click here to go to that post). Doing the floor seems like a turning point. The last of the old will be gone, and the rest of the new can now commence. Neither Dan nor I are milk drinkers. We do however, love yogurt. A favorite quick breakfast at our house is a bowl of cold cereal with yogurt instead of milk. We like cheese too (mozzarella making I'm pretty confident with, hard cheese on the other hand.... ) We like having cream for coffee, butter, or whipping. The rest I cook with (especially baking), and feed to the chickens, Kris, and Riley when he's in the mood. I'm also thinking future pig feed. 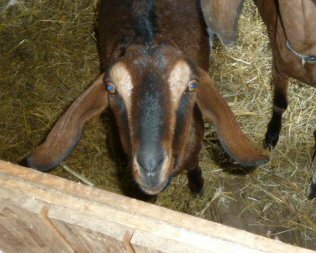 In the goat world, does are typically dried up two months before their kidding due dates. This is to give their bodies a chance to put their reserves into the needs of the growing kid(s) inside them. It means though, that when they are dry, so is the milk jug. Even after kidding, if they suckle their own or their milk is bottle fed back to their kids, there is no milk for the goatherd. I couldn't imagine not having yogurt however, so I froze about a dozen half-gallons for our dry spell. For yogurt, this is working okay, sort of. I recall having successfully frozen half-gallon cartons of homogenized, pasteurized, organic (cows') milk in the past, but my raw goats milk separates. Not just into cream and milk again, but into a top white layer and a bottom clear, whey like layer. I shake it well before making yogurt, but the result is that the bottom of the yogurt jar is more grainy in texture. Kris and Riley didn't mind, so of course no waste. On the other hand, it takes up a lot of room in the freezer, and there is the occasional misfortune of breaking a half-gallon glass jar. I don't think I'll freeze milk again this summer. One plus for Kinders, is that they are aseasonal breeders. All (at least I think all) the dairy breeds of goats are seasonal breeders. They go into heat when the days get shorter, and kid in the spring. Other breeds like Pygmies, can be bred at other times of the year. Kinders inherit this quality, so it is possible to have both spring and fall kiddings. That means a year round milk supply. Another possibility, is that of "milking through." Some does can produce an uninterrupted supply of milk for up to two years, if not re-bred. Production might decrease some when she's in heat, but can usually be brought back up again. 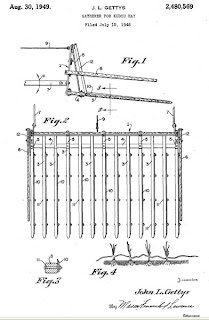 This in fact, is a technique that some dairy breeders practice. Though it means fewer kids, it is less stress for the doe in the long run and can increase her productive life. It also means a year round supply of milk. I just read recently, that for breeds that frequently birth multiples, like Kinders, carrying the weight of quads or quints year after year takes it's toll on the doe's body. Eventually she can end up with hind leg weakness. This seems another good reason to alternate a doe's kidding years and milk her through in the year's she isn't bred. During our dry spell as we have to rely on the milk I froze for this time of year, I'm mulling the possibilities over. For not being milk drinkers, it's amazing how much we rely on our goats' milk. Not only for us, but I find my chickens' eggs have stronger shells when they drink it regularly. Plus raw goat milk is good for our growing puppy. 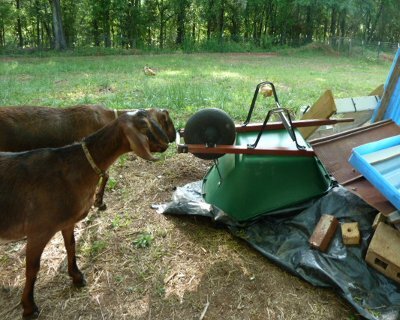 "Milking Through: Dairy Goats Can Produce Longer Than Expected to Better Meet Owner Needs"